One more bathroom project I did last weekend was making some chunky shelves made from scrap wood that I had left over from last summer’s elevated garden bed project. If you’ll remember, I made my wood vanity countertop out of cedar fence pickets, and since I just happened to have some leftover cedar 2″ x 4″ lumber, I decided to use that for shelves above the toilet. The only thing I had to purchase were the shelf brackets, and I went super cheap on those. You have to look in the lumber department of Home Depot for these bad boys, and they’re about $1.69 each. They’re really rough cut, so there’s quite a bit of sanding involved to get them to look smooth and pretty, but I don’t mind a bit of sanding. So my three chunky wood shelves ended up costing me just over $10. 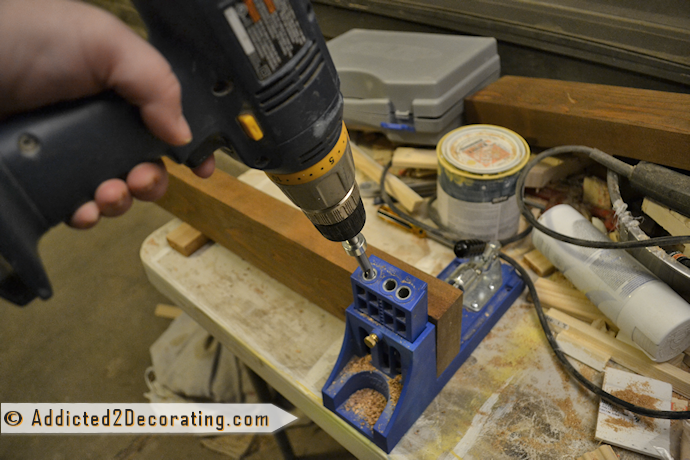 To make the shelves, I got to use my Kreg Jig. 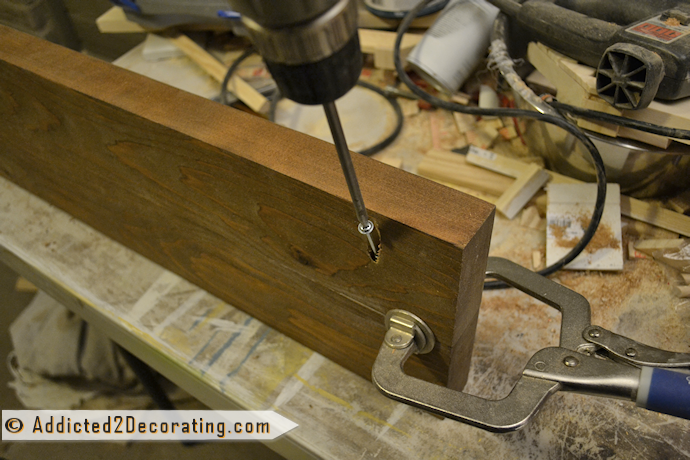 Have I mentioned how much I love my Kreg Jig? If not, let me do so now. I love it. 🙂 I wish I hadn’t waited so long to purchase it. 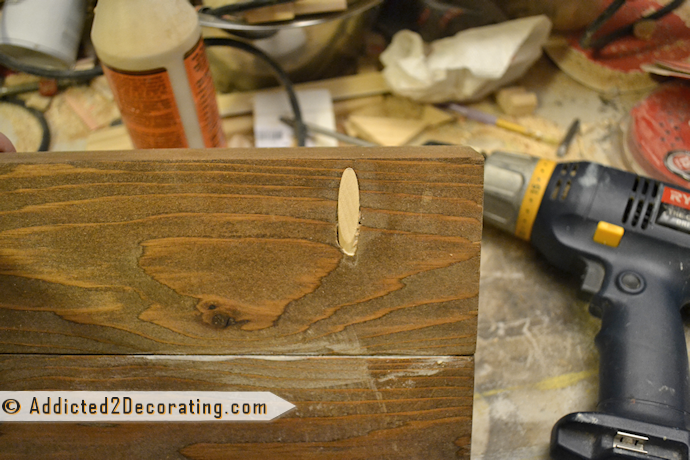 Next, I placed the piece with the pocket holes right on top, edge to edge, and used the Kreg clamp to hold the pieces securely together. 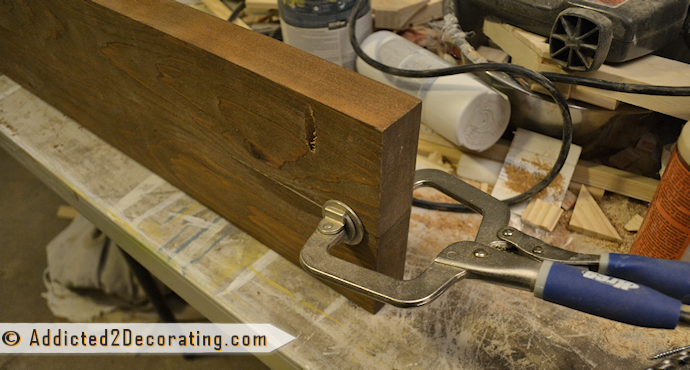 …but once the glue dries, I just use my electric sander to make it perfectly smooth. 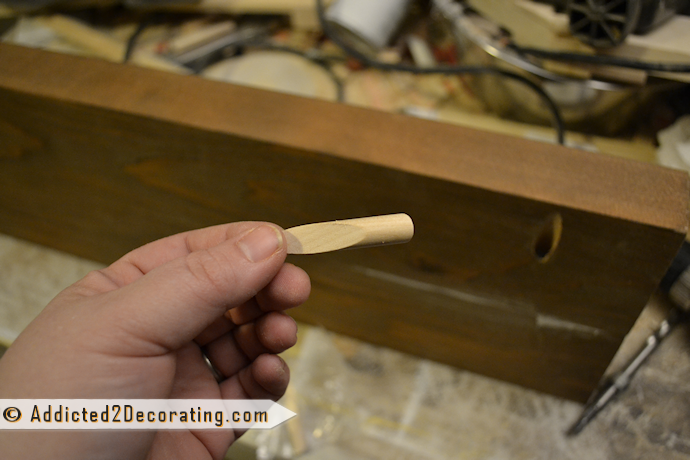 After my shelves were put together, I let the glue dry for a bit, and then sanded the shelves smooth. 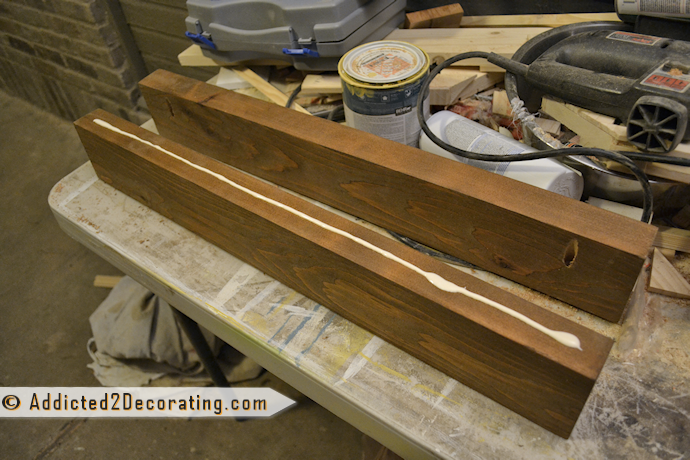 Then I stained them with one coat of Minwax Early American, followed by one coat of Minwax Special Walnut. 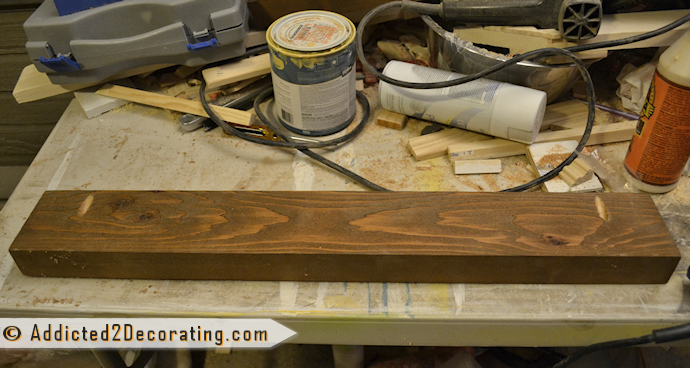 Then I finished the with two coats of Minwax polyurethane in a satin finish, sanding lightly between the coats. I have no idea what I’m going to put on them yet, so I need to give that some thought. In addition to decorating my shelves, I still have some touch up painting to do on the walls and trim. Then that leaves two projects: shower curtain and floor cloth (yep, I decided to do another painted floor cloth since I can’t find any rugs with these colors at a reasonable price). These are fabulous Kristi! I have been contemplating what type of shelves to put in my bathroom – now I just need that jig … and you to come and whip them up for me! Seriously, will be pinning these so I can try and be as fabulous as you one day! Kristi, your bath is looking so sweet! Keep on truckin’ cuz you’re almost to the finish line. I think the shelves add real class. I like the way the three of them tie the lower wall treatment to the top half of the walls. After reading an Apartment Therapy post today, I see that you’ve hit some nails on the head incorporating upcoming trends. 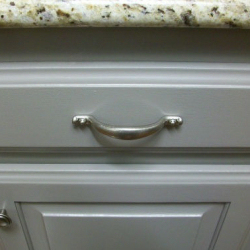 Their post is about kitchens, but you have some of the elements down, like wood countertop and open shelving. They turned out perfectly! Great way to tie different elements of your room together! You never cease to amaze me at your DIY-ing. I love every project you have done in your condo. I am also looking forward to seeing your choice for a shower curtain and your final reveal. I WANT A KREG JIG SO— BAD! You have amazing DIY skills – it is really inspiring me to take on some building projects all by myself rather than working with my husband on them! Maybe one day… Thanks for the tutorial. 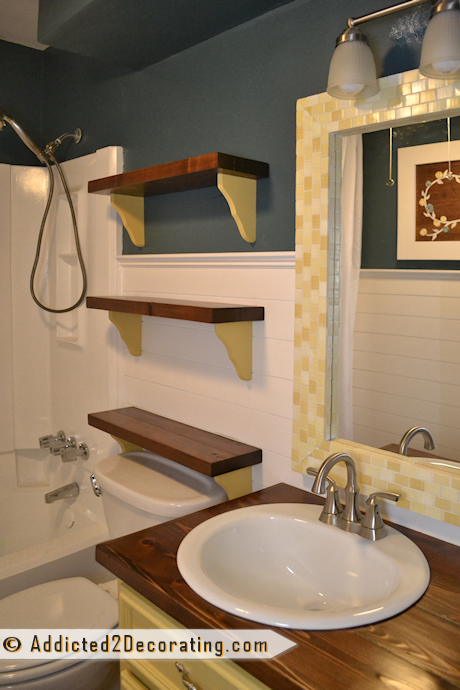 The shelves look great and really help draw the different elements of your bathroom together. I absolutely love this bathroom. The colors are so pretty and all the projects are something I could do now. These shelves are so pretty! They will be so useful, next to the sink for toiletries, small hand towels/washcloths and maybe a ‘pretty’ or two. Love the way they look and guess what? YOU ARE ALMOST DONE!!!!! How did you attach the brackets to the shelves? Wood glue? I have some wall space behind a door in my kids’ bathroom and I’m going to use some scrap lumber to make these shelves to hold each of my children’s toothbrush and cup. 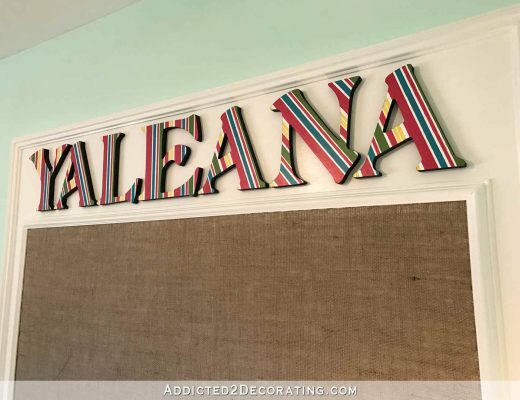 One shelf for each child with a painted, wooden initial on each to “label” everyone’s shelf. I think it will be so cute and provide much needed storage space, organization, and style. Thanks for the inspiration! Yep, I just used some wood glue. I personally use Gorilla wood glue. Building something similar today… what’s the best way to hang these on the wall? 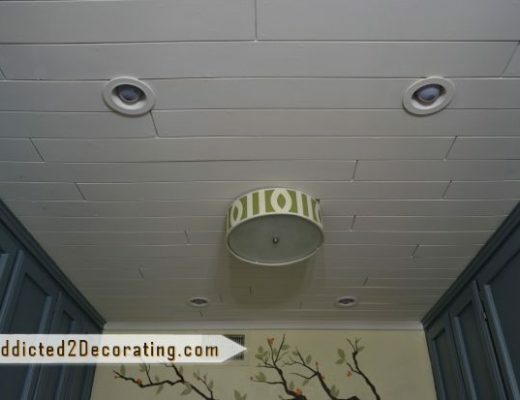 The brackets I used on mine had metal hardware inserted into the back for hanging.